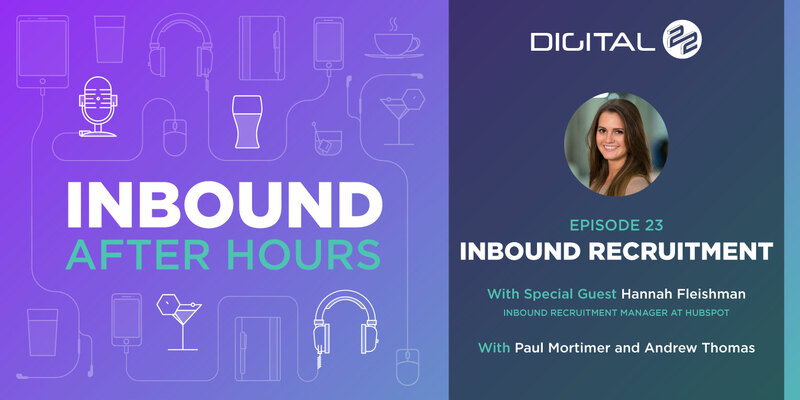 In this episode of Inbound After Hours, we speak to Hannah Fleishman who is head of Inbound Recruitment at HubSpot. Find out what inbound recruitment is and discover how you can use the same inbound methodology for recruitment, as you do to get new leads. - Welcome to this week's Inbound After Hours, and we have got a very special guest today. We've got Hannah Fleischman from HubSpot, who's gonna help us understand how to attract inbound talent. So, hi Hannah, how are you? How's it going? - I am great, thanks for having me. I'm excited, yeah. I'm the Inbound Recruiting Manager at HubSpot, so that is our very HubSpot way of saying employer branding and recruitment marketing. So, I run that programme here. - Cool, great. So, yeah, you've sort of give us a little insight into there. I think, just for the guys listening at home, if you could run through your role day-to-day and sort of what you do, what you get involved in, who you speak to and sort of what your goals are on the HubSpot side. Yeah, if you could explain that, it'd be awesome. - Definitely, so, think about what inbound marketing and the inbound philosophy is. It's to get people to kind of come to you. Whether that's to help them buy your product or service, or help educate them on what your business does. It's to create content online and really drive people to your website and to want to learn more about you, as opposed to pushing information out. That's kind of the concept that HubSpot is built on, and we use that philosophy pretty much for everything that we do, the idea that we always wanna sell for the customer and add value. In the recruiting world, we also take an inbound approach, so the way we think about hiring is not just cool, like in the old school days, where you would just kind of put up a job posting and hope that somebody applied, and give them no information about why you're company's great, no transparency into what you're culture is like, things like that. We think about hiring more in an inbound way, where we want to give candidates and potential talent tonnes of information about how to find a job, how to find a job at HubSpot, how to apply, tips for interviewing, all this sort of value-add content that would not just help them grow, but hopefully make them want to work at HubSpot. So, that's how we think of inbound recruiting, and what my team does on a day-to-day looks like a lot of different things, so like a lot of marketers, we have a three-person team. So, like a lot of marketers working with smaller teams, you're kind of doing everything on a day-to-day, from, for us that means recruiting events globally, we have seven global offices, so we do a tonne of recruiting events. We do, we have a recruiter's blog. We run our jobs website and all of our webpages about working at HubSpot. We do social media, so we have a Facebook page and an Instagram just for our employer brand, called HubSpot Life. Shameless plug, go check out #hubspotlife. Hopefully, you like what you see, but that's kind of what our team does, we share with the outside world what's going on at Hubspot on a day-to-day. And then, we do a lot of other things related to how do we promote the conversation around diversity in hiring, and how we do all that through content and email nurturing, and website and paid ads and all that good stuff. - [Andrew] So the three of you are recruitin' for Hubspot all over the world? - Yeah, so, we are, we're trying to. We have a, yeah, well, not the three of us. We do the recruitment marketing piece, and then we have a pretty global recruiting team, where we have recruiters on the ground doing the recruiting piece of it, and reaching out to candidates, and working with candidates in all of our offices. But, our team really creates the air cover for them, so that those candidates already know that HubSpot's a great place to work. - So, that's basically taking the inbound methodology as people listening may, that approach that they're taking to their marketing, you are directly applying that to the recruitment process, to bring in applicants in a truly inbound way. That's good that you live by the sword, die by the sword, with the way you recruit as well. Has that always been the case, or did HubSpot start more traditionally and think, actually, we should really stick to inbound for our recruitment? - Yeah, no, it's a good question. You know, for the most part, we've always kind of, I hate this expression but I also love it. We do drink our own champagne or eat our own dog food, whatever you want to say. I think we always have because we are, by nature, a content-driven company that wants to truly help whoever our users are, whether that be a candidate or a customer or whoever. I think HubSpot always has truly cared, and that comes through in how we do things, even if we've never structured it or formally done it. So, when I started at HubSpot, it was about five and a half years ago, and we had 300 employees total. We only had one office, and that was in the US. Now we have over 2000 employees all over the world. At that time, we didn't have, we had never even thought of what inbound recruiting is, or used those words. I think we maybe had one or two full-time recruiters. We did recruiting the way most companies would do recruiting, but at the same time, we were putting together our culture code. Our co-founder and CTO, Dharmesh, published the culture code around that same time, about five years ago, and that was 130 page slide deck all about what we value, how we work, what our perks are like, how we're flexible, things like that. He just published that cause he thought it was an important piece of content to share. There was no recruiting motivation behind it. It was just like, we care about this culture stuff, and we're content creators, so the two kind of came together. So, that slide deck has about 3 million views today, and it's the top reason that people say they want to work a HubSpot. So, I think we always take an inbound approach to things, now we just have a structured approach around what the team looks like, and what do on a day-to-day. - Reminds me of something we said on a previous podcast. We were looking at inbound, like what is inbound, and what is an inbound blog and those couple of podcasts. Something that came up was a lot of it's just common sense, and if you just naturally, offering value like that to your own employees, and then people can see it, who want to become an employee. - The synergy's like natural, isn't it? - [Hannah] No, you're absolutely right. Yeah, I think you're right, and it's music to my ears to know that also sounds like common sense to you. I think we're always surprised how many, whether it's job websites you look at, or stories you hear about candidates who apply for jobs and never hear back, or they get a terrible canned response a year after they applied, and things like that. For us, it's also common sense that if people want to work with you, or do anything with your business, it's common sense that you'd want to help them and help them solve that problem, but I think there are a lot of companies out there, and I would say the majority, who are still kind of catching up on the recruitment side of things, with adding value there. - Yeah, I mean we, the common sense thing, I think from our side, and I think a lot of other sites, the about us page is such a, it's the second most viewed page on our website, so we've spent time getting a picture of the team on there, a bit of cultural stuff on there, about us as people as opposed to we're a great agency, or whatever you may think you need to tell a candidate to impress them. Is there any way, how does HubSpot go about that? Obviously, you've got a very healthy blogging ecosystem over there, but how do you go about translating HubSpot's culture, which is great, to candidates? - The first piece is actually, probably, figuring out, it's important to figure out internally that everybody deeply understands what your culture means, because otherwise, if you talk to candidates, you meet them at a networking event, you interview them or something, you share content, you might have a completely different definition of what culture is at your company than somebody else does. I think that can get a little tricky, because it's not an aligned experience for the people you're trying to recruit. So, I think, publishing the culture code and talking about culture so much internally here, means any HubSpotter that you ask in any office, I can guarantee you, if you say, "How would you describe HubSpot's culture in two or three words," they would say the same thing. The would say transparency, autonomy, and flexibility, and all those things help us grow. I don't want to bet a million dollars on that, but I can guarantee you that, for the most part, people would say that, or some version of that. That's not because we're marketing it all the time, it's because we talk about it a lot, we care about it a lot. I think the first piece is that. You have to solve it internally first, because then it becomes easy to tell the story and do the marketing. I think there are two ways we do that. The first piece is kind of, the proactive content that my team creates. We have a pretty robust jobs website, where we get into detail about how every department works, and the things that they do on a day-to-day, and photos and videos of day in the life, and that sort of thing. The jobs website is a piece of it, and then we share a tonne of content. We do two to three weekly Facebook lives, where we talk to HubSpotters about what they work on, how their teams work, things like that. And then, any time there's some sort of culture activity, event, anything going on, we share it. So, that's part of it. The other piece is that I actually think, especially for smaller companies that don't have huge recruiting teams and that want to do more recruitment marketing, but don't have resources, empowering your employees to create and publish content about your culture is going to be so much more effective than trying to do it all yourself. So, we have a careers blog, but we have a full time person dedicated to creating content on the careers blog. So, not everyone is gonna have that, and before we did, we just made it really easy for any employee to share and use #hubspotlife, and we'd help them edit content if they wanted to publish it on their own blog, on their LinkedIn, write about it, whatever. I think it's coming up with a little bit of structure for helping employees use their own voice too. - Great, yeah, I think for the in-house guys listening, that idea of creating, it don't have to be 130 slides, but maybe some sort of, a few slides on culture. - No, it has to be 130 slides! Everyone wants to read all the way 'til the end. I promise you No, I'll send you a cliff notes version. We need a shorter version. - But, I think that's, I mean, we have core values. Company internal presentations, the first slide is those core values. We just remind everyone what they are. We use the internal reviews and the way we speak to each other, and grade each other, sort of, for any internal prizes, things like that. So, I think, just weaving it in and it isn't just, it's great, should be on your about us page, or on the website, but it's not just about that. Like you say, the organic internals, getting people to believe it, and repeating that, and again the buy-in, day-to-day's gonna help. The outward, eventual people sharing content and creating it. - Definitely, what are your core values? I'm curious. - [Hannah] This is a test. - It is a test. - This is a test. - We can edit this, though. - We can pause this. - The one big one. - Whatever you call it, the central one. - And then, we've got be passionate, but be calm. That was be excited, but not excitable, but we've simplified it a bit. - That's also very tweetable. - Want it, believe in what you're doin', cause we think if you're not believe in what you do, you won't enjoy it, and if you don't enjoy it, you won't perform well. And then, we do these, they're all part of a sheet where we have gets it, wants it, and capacity to do it, in what you're doing. - There's your culture code, right there. - Anyone who wrote that down We'll put that down. No, we do hold our end down. But yeah, it's something we're trying to do more of, so it's, yeah, once we can start getting people creating content internally as well. I think in-house teams who may have, they may be the only marketer that is responsible for content could still encourage people to share their thoughts, and get some kind of co-branded stuff done, and get sales team and people involved too. - It's interesting what you said Hannah, about the, showing the events that are going on, stuff like that. We're undergoing a big recruitment drive for the past few months or so, and throughout this year, and getting involved in interviews. It's amazing how many people have said, "Oh, I love the office culture, "what it looks like on Facebook and Instagram." And all we're doing is posting the odd picture every now and then of stuff that's going on, but Perry's fed back, who's our HR Director, she's fed back that people have said that's notably why they've applied. They can see inside the company and get to know people a little bit, and want to apply. - Yeah, that's a huge impact. I'm sure you guys, the little things which you may not have put tonnes of work into doing, just the odd tweet or a quick pitch, can make all the difference to people. - It's come for the cake. - Well, right, cause that's the thing too, cause like you said about common sense. To us, that seems like it's obvious, like of course we'll share photos of the office, and take the odd picture, and Facebook and stuff, but candidates, they appreciate it more than we probably realise, because so many companies do not do that. And they feel like they don't have an inside look that way, but, yeah, it's funny too about that. I think when we first started the inbound recruiting team here, it was almost two years ago now, when we put structure around it, and I think we had this idea that HubSpot was a growing company, and we had more sophisticated marketing, so our employer brand needed to be really slick graphics and all these high res photos, stuff, and all this sort of thing, and the more that we started creating content from employees, and doing an employee takeover on Instagram, for example. People just want raw stuff to feel like they're there. It actually, it's great too if you don't have as many resources, because you don't really need to hire people, you don't need a designer. You don't need a professional photographer. You just need someone with a camera most of the time, to show what that looks like. - Just someone who's available to snap away, and that regularity as well, letting people know it isn't just, oh, it's the one-a-month who remembered to take that picture and show it. - You can tell, can't you, definitely. On that sort of idea of how conveying culture and getting that across externally, looking internally, I know you guys have got a lot of, well, you've got some remote workers, we don't have any actually yet, how do you go about getting people into a culture of a place they aren't on a day-to-day, if ever? Is that something you've had as a challenge, in conveying that and keeping that? I know you guys have got a lot of documentation on that side of things, but sometimes, obviously, that is just a slide deck. How do you go beyond and keep those guys engaged and on the same page as everyone who's in Boston with you? - Global culture, and how we scale that? - Yeah, yeah sure, definitely. - It's a really good question. I think the autonomy piece is huge, to begin with. The autonomy and the transparency, I think, because we don't think of culture here as a federal level thing that everybody needs to operate this way, and put this on the wall in the office, and every office needs to have this poster, type thing. I think if it's a federal versus state type thing, it's like federally we have these values that everyone believes to be the true core values, and everyone has bought in on that and they know that. What that looks like in practise might vary a little bit from office, and you kind of have to be comfortable with that, and that's not a problem. If people embrace it, and do that in their own way, I think that's a good thing. So, what we do is, we have a culture team here, that's part of the team that I'm on. We have two full time people in Dublin, in our Dublin office, and then there are about 9 or 10 of us here in Boston, and then our office managers are also kind of culture counterparts, in our eight pack in Berlin offices. There's just so much transparency and idea sharing between like, hey, we did this cool activity, or there's this free event coming up in this city that you should all attend, or here is one way to host this, or dial into this. There's just a lot of idea sharing, I think, and we do a pretty good job of that, and being transparent about what people like and what works. So, I think the fact that we have a big culture team who's actually proactively thinking about not just how do we make our HQ office great, but how do we make every office great in a way that feels local to them. We think about that pretty proactively. - Awesome. Cause I can imagine you've got offices all over the world, and a good culture, and that office is gonna be different isn't it, for that country's culture itself, and the way that people are expecting to work and everybody works differently, so yeah. - Yeah, I mean, I think my favourite, I spend a lot of time in our Dublin office, both personally cause I love Dublin, but also because we have a growing team there and a lot of recruitment needs there, but in the US, team building, it's a lot more high fiving and that kind of thing, and then when I come to Dublin people are like, "You guys high five too much. "It's all about awesome," and this sort of thing, and it's just cultural nuances that you have to keep in mind, because the way that you celebrate things or talk about things or write about things, culturally, is not always gonna resonate. - Wait 'til you get an office in Lancashire, where we are. - You not allowed to shout about good things and high five each other. - Hidden up in the hills, yeah, no, it's very different over here, isn't it? What's next for HubSpot in terms of culture and new things that you've got planned? How are you expanding the team? What's gonna happen and how are you planning on managing that this year? - A big one, sorry. What are you gonna do? - It's something that I think about a lot, and if I didn't, it's good you asked me, cause I should. - Start with this afternoon. - The way I'm thinking about our inbound recruiting team is, I very much think of last year and the year before that as, if you were a startup, you would have been a seed stage startup with no funding yet. Like scrappy, just getting started. That was the year when I was a team of one, and I partnered with recruiters, and then we tried absolutely everything. Like, what are the low-hanging fruit pieces of content we should have that we don't have? Are we using social enough? What should we try? We just did everything. I would say this past year, we grew the team. There are three of us now, and we're much more strategic about choosing what works and what doesn't, and not just doing everything our recruiting team could use, but just focusing on the problems that are most immediate now, and the ones that are gonna help most long term. So, for example, we know that hiring for diversity is something that all tech companies struggle with, and it's something that's top of mind for us. That doesn't mean we're just gonna write a blog post about, like, we care about diversity. We need to make thoughtful contributions and thoughtful considerations about how we not only do that internally, and set people up for success internally, but how does our team then tell that story externally, not just for the next year, but couple years. I think now we're getting more strategic about both what channels we use, but also what stories and topics we choose to tell, and what matters. I think there's that, and then, moving forward, I think we're just gonna get more robust and more strategic about how we do that. So, we're hiring, we just opened, or we're opening next week, a role on my team to focus purely on PR, so we're gonna hire a PR manager just for culture. So, that's proactive pitching globally about workplace stuff and culture and flexibility, and why HubSpot's a great place to work. The next move is, we have this great internal content machine and this great events machine, the next piece is the PR piece. - Yeah, awesome. What sort of methods are you using? Obviously content makes sense, and I know you guys have got that sorted. Do you look at it? Do you do paid ads? Do you do email outs? Obviously you've got a decent size database there to be working with. What sort of things are you looking at using this year? - Yeah, so, we don't do a tonne of paid ads. We've done some LinkedIn ads. I think it's in our DNA that we don't love to pay to play. We'd rather create the content. That said, there are certain markets and roles that are really hard for us to reach people in, and in that case we'll do some paid ads. But, a couple things I'm excited about are, one is video. We do a lot of video right now. We're gonna not only do more, but I think we're gonna start doing it better, so I imagine we do about two to three Facebook live videos a week. That's usually some form of a Q and A type thing, with a leader or HubSpot or hiring manager. Those are performing really well, and they're quick for us to put out as a small team, which is really cool. Next up, we're trying video job descriptions. So, just really low-fi. Someone talking about I'm hiring for this role. Here is what would make a successful candidate. Here is what the work would be. A minute or less, and just see if that's a little bit more dynamic than a very boring job description, which most of them are. I'm excited about that. Another thing we're thinking about is, we have the long form content thing now, so you guys are inbound marketers, blogging works, blogging is great, but it's a slow burn, and our careers blog is great, but it's gonna be kind of our SEO source long term, and I'm really glad we have it to share ideas. That said, we need a way to get more content added faster, from the people that want to share it. So, from all of our director levels and above our hiring managers, so we're experimenting with short form content on LinkedIn, and we're finding it performs a lot better. So, we've been working with our sales managers, cause we're hiring a lot for sales right now, where we give them a prompt every week, they write 150 words or less, we edit it very lightly, and they just publish it as a LinkedIn status update, and some are getting, I think one of 'em got 60,000 views in under five days. So, that short form content is just performing better on LinkedIn, so we're trying out more experiments like that. - Awesome, that's really good. It's good to know. - It's good. That's useful for us for our marketing. It's useful for people listening, in terms of recruitment, but also just repurposing your content. It's yet another thing that you do with your content anyway, so why wouldn't you do it for recruitment? - It's about evolution of content, and the job out to video, which we're doing with ebooks and blogs, and it makes complete sense to just use that and those ideas that we read, about turns on the marketing side, and just take that and use it throughout the company. - Cool. So, one thing we ask most people that work HubSpot is are you going to Inbound this year? Will we get to see you, cause we're going. - [Andrew] Yeah, yeah, we'll be there. - Yay, were you there last year? - Yes, we've been the last few years. - It was my first one last year. - I really geeked out over Michelle Obama, as I know everybody did, but it was a really great, I thought last year was the best year yet. - 15,000 people chanting inbound, it's pretty cool. - With a DJ on top of the crane. - It's a marketer's Disney World. I can't wait for this year. I'm so happy you'll be there. - Biggest team yet, I think. - Yeah, I think so. Hopefully, we'll bump into you there. But yeah, that's everything I think. Anything else from you Paul? - Yeah, we're quite food oriented. It's like here, and my marketing's just below. - Lunch is a big thing for me too. I won't say in a pinch. I don't know yet, we'll just see what comes my way. We'll see what looks good when I get to the HubSpot kitchen. - Yeah, we know the Dublin HubSpot has good food, so can imagine you guys have got something similar, equal, over there. - Yeah, we have a pretty well stocked kitchen, so we'll see what I can make in there. - Thanks guys for watching. - Thanks Hannah for joining us. - Thank you, this was fun. I realised too, if it's Inbound After Hours, I probably shouldn't have said it's lunch time. Does that, did I blow up your spot? - The only difference is, we usually have a pint or something with us, so we slipped up there. We could have done with that, but yeah. - I would have been jealous, so I'm glad you didn't do that. - Yeah, so yeah, that's good. All right, cool. Okay guys, thanks for watching. We'll see you again next time. What is a Diamond HubSpot Partner?